Returning to the harrowing personal drama he perfected in 21 Grams, Academy Award winning Traffic star Benicio Del Toro takes on another intimate and demanding role in Danish director Susanne Bier’s first English language film, Things We Lost in the Fire. The result is an uneven but powerfully acted and intelligent drama that actually improves after the final credits roll and you dwell on the work which seems to recall the classic women’s weepie cinematic style of All That Heaven Allows, The Magnificent Obsession, Written on the Wind, and Imitation of Life director Douglas Sirk in the 1950’s (which was brought back to the big screen in the early 2000s in Todd Haynes’s Far From Heaven). Monster's Ball Oscar winner Halle Berry—who fought hard for a role that was originally written for a white character, just knowing in her soul that she needed to do it as she shares in the Blu-ray makes the most of her difficult turn as Audrey Burke. An upper class Washington state housewife whose picture perfect marriage to David Duchovny is cut short when he intervenes in a domestic quarrel and ends up shot in a tragic murder/suicide. Left reeling from the horror of the unexpected death and trying to keep up appearances for her two young children (Alexis Llewellyn and Micah Berry), Audrey reaches out to the troubled Jerry (Del Toro), her husband’s lifelong best friend and former successful lawyer, now living in a seedy motel addicted to heroin. 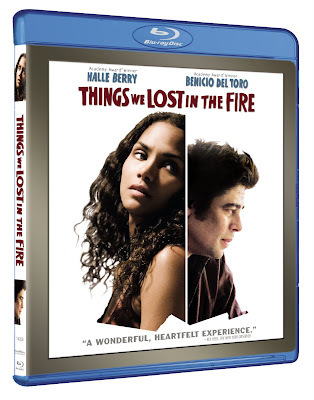 However, regardless of this and doubly so on additional viewings, it’s fascinating to witness Halle Berry and Benicio Del Toro play off of one another, easily volleying back and forth to give their scenes an incredibly tangible, complicated, indefinable spark that echoes the thematically similar relationships in Bier’s previous films Open Hearts and Brothers. Moreover, strongly believing in both rehearsals as well as an organic shooting experience that has performers honoring the script but ultimately speak in a way that’s most natural at the time, we get a sense of the unique skill sets the actors brought to their respective portrayals as in the Blu-ray Berry discusses the challenges of playing the state of shock without simply exuding nothing and as Bier explains, Del Toro’s earnest sense of humor manages to shine through in the most unexpected of ways. Thankfully, it’s the way he strives to “color a scene… as humorously as he could,” as Bier was quoted by DreanWorks that helps get viewers well-invested and more inclined to commit to a film which on the surface at least, is a truly emotionally devastating piece of material. Yet as Bier surmises on the disc, she can’t imagine making a movie without the idea of hope but in never wanting to hit the audience over the head with it, she wanted to make the film celebrate the insurmountable strength of the human spirit to heal much like the way, she argues that grass manages to grow up through pavement. While it doesn’t compare to Bier’s foreign work and in the end, you're still left with questions by the time the credits roll and they feel that allowing us to get to know the character of Audrey is a human being in her own right would have elevated the film considerably since so much is left to the imagination that at times you could just dub her “the grieving widow going through the five stages of grief,” I nonetheless still feel that it’s an underrated worthwhile and emotionally riveting film. A work that I actually appreciated much more the second time around in its recent Blu-Ray release that helps supercharge the imaginative cinematography and Bier’s obsession with extreme close-ups beautifully lensed by her cinematographer Tom Stern (who had “worked very closely with Conrad Hall” on American Beauty and Road to Perdition as Mendes explains)—unfortunately the sound balance leaves much to be desired as you have to keep your thumb on the volume of the remote an awful long time to barely make out the whisper-level intimate dialogue. Still, it’s of considerable interest especially for fans of the actors, Bier (and Sirk for that matter) that will hopefully inspire them to check out her foreign fare. However, I do hope that in Bier’s next film, she’ll contribute to the screenplay herself. For, given her vast experience and roots in the Dogme film movement, her cinematic instinct is unrivaled and we should entrust more of her unique style of shooting to the finished product that go beyond a few impressionistic reaction shots to help truly showcase just what she can really do in the position of writer and director.